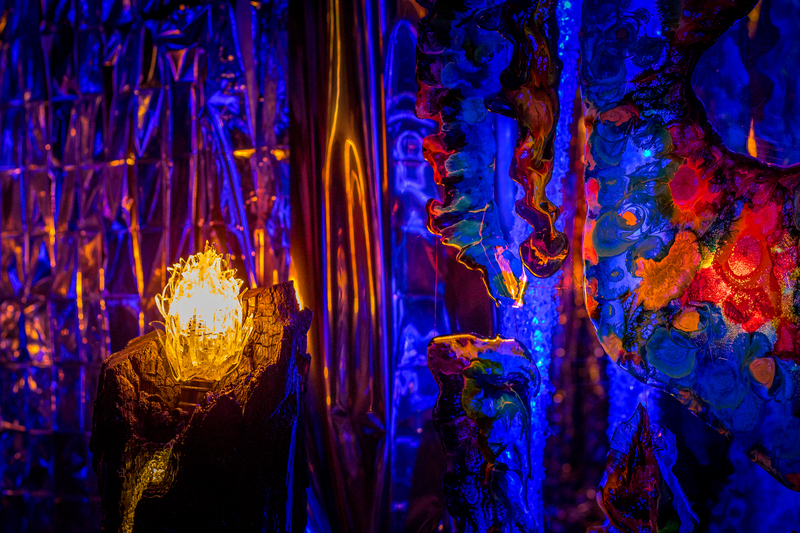 I was intrigued when I learned that there was an artist in Los Angeles who was turning the tragic wildfires into beautiful works of art, so I went to Radiant Space Gallery to see his work and was surprised to find the walls and floors of the gallery wrapped in silver mylar, reflecting the light from his beautiful sculptures in every direction. It was a wonderful, glowing display that allowed me to feel like I was not only visiting the infinity of our universe, but part of it. Darren Sarkin, the artist behind the magic, had also constructed a small, mirror-filled pod, which I sat in, and found myself gazing at infinite versions of myself. I didn’t need to see that much of myself, so I quickly exited and then realized the point of this pod: to reflect on ourselves and all the versions of US. As with all artists that I deeply admire, I wanted to find out more about what drives him to create, so I sat down with him to talk art and creation. One of your professors once told you to “only be an artist if anything else drives you mad.” So what drives you mad about the world outside of art that has driven you to be an artist? I’ve recently appended that professor’s statement to, “Be an artist to stay mad.” My life’s path is to radically express myself, and move honestly through the world, doing no harm. Imagine attempting to be fully expressed and honest in every moment. If I worked in an office, for me that would mean alternating moment to moment between crying and going into rage. I think if most people were honest about their emotions, they would look equally crazy. So I do art. It allows me to show myself, feel joyful, and act weird and ridiculous without seeming out of place. The first time I saw your work was at Radiant Space in Hollywood, the burned wood sculptures that you made with light inside. It’s amazing how you, as an artist, took something from a tragedy and gave it new life. Can you discuss the importance of “rebirth” as a theme in your art and how it began? These questions are too good! I want to write a book on each. For me this path of “doing no harm” is new. Part of what led me here is an obsession with what’s broken. Without fail, this human existence is destructive, but I found a personal way to do better by repairing that which breaks. All of my art uses recycled materials, trash, things I broke. I feel thrilled to share this attitude, to inspire others to creatively encounter destruction, and find ways to enact rebirth. How long have you been in Los Angeles and making art here? I first moved to LA in high school to live with my Dad. Immediately I dove into the artistic path doing theater, improv, and making intricate drawings with Sharpies mostly. Since then, I jumped around this state – and the world – trying any art that would keep me alive. I directed plays in Beijing, I busked with a guitar through Europe in winter. It’s been thrilling and I seem to still be alive, but no one cared about what I made until 5 years ago, when I moved back to LA and devoted myself to visual art, sculpture, and light. Why is art so important now, more than ever? Or is it? I agree that it is. As far as I can tell, our culture has lost much of its beauty. Some combination of losing craftsmanship and gaining an elitist art structure obsessed with making statements and surprise, but our society lacks aesthetic. All cars look the same, most cities are gray, most people are insecure with the question, “is that art?” We don’t know what beauty is, so we can’t make more of it. Understanding beauty is at the heart of being grateful for life in this privileged society. We never need to worry that our tap water will kill us, but we don’t care. Art can help us seek beauty, become grateful, and then live creatively. What is it like working in Los Angeles as an artist? Are there a lot of opportunities or is the landscape just too big? There are infinite opportunities, but I still support my life doing technical design for events. I see how corrupting money can be to art, and so I am grateful to not need my art to keep me alive. It lets me be selective about how I work and who I work with. If I needed to make art for money, I would quickly become desperate and lose myself. It helps me to remember many famous artists have worked day jobs: Richard Serra and Philip Glass worked for the same moving company, Kurt Vonnegut worked as a car dealer. Do you see your work being in the bigger, mainstream galleries such as The Gagosian, or other museums, in the future? Is that even the path you want? Museums are not my goal. My goal is to create beauty in such a way that it touches people and slightly moves our species into creative collaboration with the planet. If my work gets anywhere close to this goal, it will probably end up in museums, but I think creating art with any goal of personal success reeks of corruption (please remind me I said this in ten years). Aside from art, what moves you? What else do you do with your time? Moving moves me. I love to rock climb and meditate. I try overly hard to find balance between taking care of myself, the people around me, and the world. It’s so difficult not to hurt something regardless of what I do; to be deeply creative is harder. I’m progressing with the goal of making every moment of my life into art. Part of being an artist is being a good Salesperson. Do you love or hate that part of it? See it as a challenge? A necessary evil? I stopped trying to sell things this year. Other people can be salespeople if they want. I want to connect with people. Every year, I show at the Brewery art walk, where, for two days, hundreds of people walk through and look at my art. In the past, I would act gregarious, talking to everyone, helping them hear this ‘important’ message, and desperately hoping they would buy from me. Recently, I decided this was terrible, so at the last art walk, I ignored everyone except for those who showed great interest in me or my work. Instead of talking to hundreds of people, I had meaningful conversations with probably 20 people total. Maybe this will be better for ‘sales’ in the long run. Maybe they will remember me better. I don’t care about that, I care that I made those moments worthwhile. What is coming up for you? Events? Shows? Currently, I’m showing in Luminosity 2.0 at the Loft at Liz’s Gallery through January. I’m working on two big projects for the beginning of next year, but am not quite ready to discuss them. Otherwise, continuing to become more creative and more refined in how and why I make things.